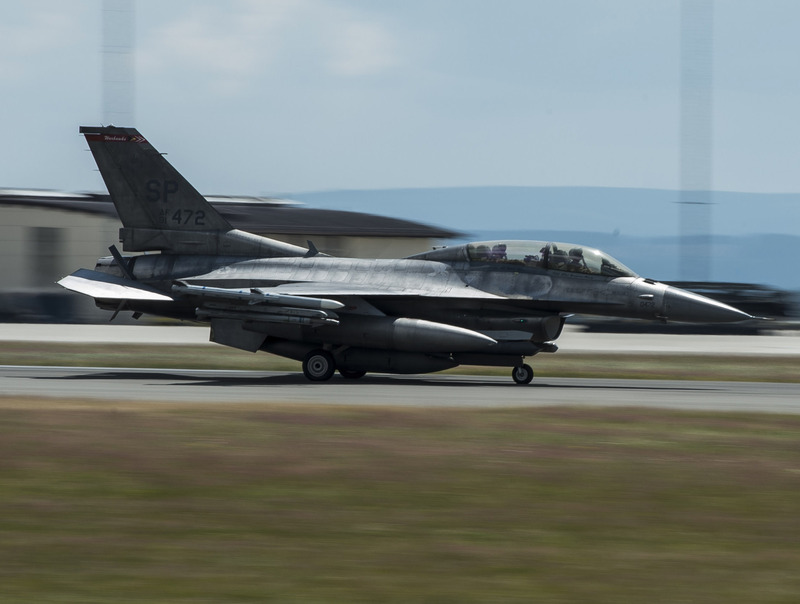 The U.S. Air Force recently grounded 82 two-seat Lockheed Martin F-16D Fighting Falcons due to canopy sill longeron cracks that have developed between the front and rear pilot seats, according to a Tuesday statement released by the service. Longerons are load-bearing aircraft structural parts that run along the fuselage—providing the airframe with its strength. “As aircraft accumulate flight hours, cracks develop due to fatigue from sustained operations,” said Lt. Col. Steve Grotjohn, the deputy chief of the Weapon System Division in a statement. According to the Air Force the longeron cracks were found after a time compliance technical order (TCTO) after cracks were discovered on one jet during a post-flight inspection. The Air Force said it has inspected all 157 F-16Ds and cleared 75 to fly. The remaining 82 jets remain grounded while Lockheed and Air Force engineers analyze the damage and develop temporary repairs to enable the F-16Ds to fly while they work on a permanent solution. Lockheed Martin deferred questions to the Air Force. “Lockheed Martin is actively working with all F-16 customers to address the inspection findings,” Mark Johnson, a company spokesman said in a late Tuesday statement to USNI News. As the F-16 fleet ages, maintenance problems are becoming more and more common. However, longeron cracks such as these are not unprecedented. In November 2007, a Boeing F-15C Eagle disintegrated in midair due to cracked longerons—which ultimately was traced to a manufacturing defect.